Thanking security guards for being punctual and fulfilling their duties on time, PM Modi said that security guards inspire not just me, but the entire nation and hence we are all thankful to you for being pro-active in guarding people, village, cities or wherever you work. Modi said security guards ensure to stick to their jobs irrespective of circumstances, weather or festival. People don’t know them, nor do they know their names, and then also security guard selflessly work for them. The Chowkidar wave doesn’t seem to stop as Prime Minister Narendra while addressing 25 lakh security guards across the country through audio interaction on Wednesday took a jibe at opposition for disrespecting chowkidars and their work. He lashed out at opposition for being inconsiderate towards chowkidaars. Thanking security guards for being punctual and fulfilling their duties on time, PM Modi said that security guards inspire not just him, but the entire nation and hence the nation should be thankful to them for being pro-active in guarding people, village, cities or wherever they work. Modi said security guards ensure to stick to their jobs irrespective of circumstances, weather or festival. People don’t know them, nor do they know their names, and then also security guard selflessly work for them, added the Prime Minister. PM Modi answering a female security guard’s question said that nation should be proud of the fact that they are being protected by a female security guard. The lady in her question told PM that sometimes security guards are seen as thieves. PM Modi answered that people don’t understand the kind of work and situations security guards have to go through as they only believe in unwanted criticism. Modi went ahead hitting out at opposition and said that influential people quite often insult those who work, especially if a kaamdaar like Nardendra Modi becomes the Prime Minister. One is known by his/her work and not name, therefore everyone should have their inner chowkidaar alive, said Modi. 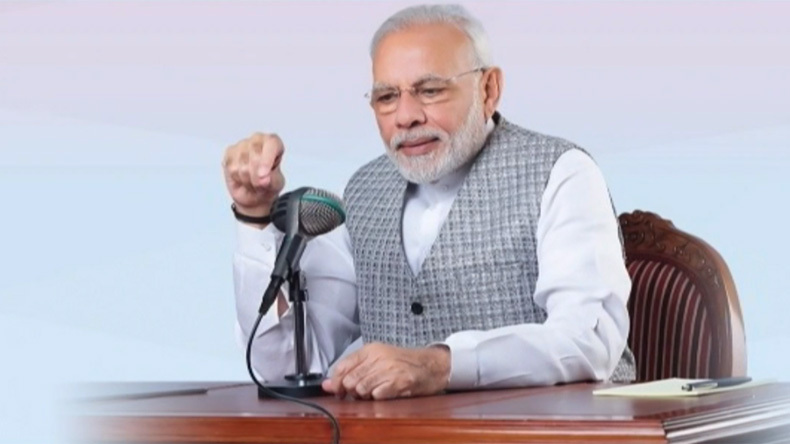 Another person during the question-answer session referred to Balakot strikes by the Indian Air Force in the aftermath of Pulwama attack and congratulated Modi for making the nation proud. He asked PM Modi not to think of critics as the entire nation stood with him. Modi, in response said he was touched to have support of people from across the country and it made him even happier when a commoner comes out in support. He also said the Tukde-Tukde gang (opposition) was trying to tarnish the fervor of Balakot air strikes as they could not fathom the fact that IAF outsmarted Pakistan’s forces. Modi further played down opposition for being a spoilsport and said it was Pakistan which was bombarded but the impact could be seen in India as there are some people who are hurt in India. He further said that country needs to be wary of such people and not engage in their dirty tactics. At the end of the interaction one person addressed Modi saying ‘Mai bhi chowkidaar, aap bhi chowkidar’, to which Modi replied instantly saying, glad people connect themselves with Prime Minister. He said that thin line between PM and a commoner should be blurred and everyone should work together for nation’s welfare. It’s not just security guard who’s a chowkidar hence a teacher, doctor, and PM too is a chwokidaar as everyone is serving the nation in their best capacities. PM Modi also referred to various schemes like Ayushman Bharat, Pradhanmantri Jeevan Jyoti Beema Yojana, introduced by the BJP-led government at the Centre for people. Modi concluded by saying chowkidar won’t stay mum (chowkidar chup nahi baithega).